AHM's EMD SD40 model featured dual flywheels and 8-wheel drive. The Yugoslovian-made EMD C-truck diesel featured a similar design to that found on other Mehano tooling. 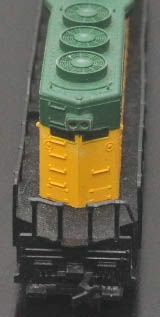 The SD40 nose, cab and long hood are one piece and the frame, pilots and handrails are another one piece section. This casting style does provide the model with treadwalk, not a usual feature of models of the day. At the time of its release, AHM's SD40 was given some serious efforts by many modelers to make a fairly prototypical looking model. 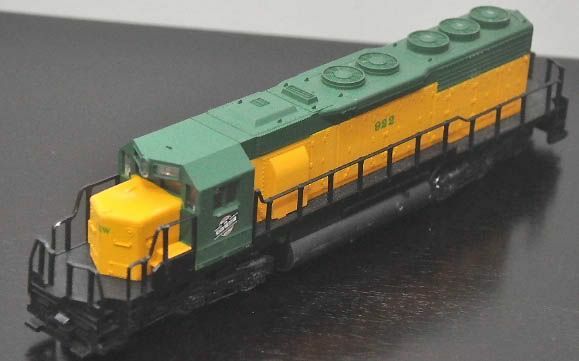 A similar SD40 is also found in Mehano packaging and also has been released in the U.S. from Model Power and IHC Hobby at various times. Later examples feature a revised tooling with open pilots to allow for the swing of a truck mounted coupler, this is not a known spotting feature of AHM examples. 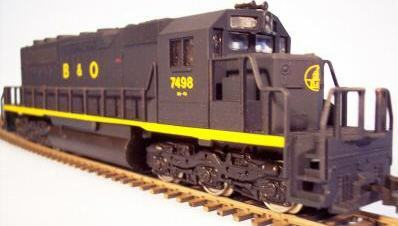 Below is what would at first appear to be an AHM Baltimore & Ohio SD40, however the model is a custom run B&O paint offered at one time by Bev-Bel. The Bev-Bel line offered many exclusive roadname offerings on models produced by other companies, notably Athearn and Life-Like. Bev-Bel's is no longer in business. 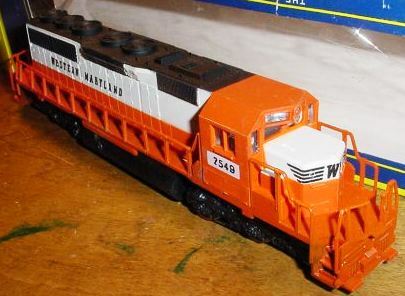 The custom SD40 release from Bev-Bel dates to 1983 and included: B&O (#4153), Central of New Jersey (#4151), Pennsylvania (#4150), and Western Maryland (#4152). Differing from AHM's circus scheme WM SD40, Bev-Bel's model was black with yellow lettering. The prototype SD-40 was produced between 1966 and 1972 by General Motors' Electro-Motive Division. You may read more about the SD-40 at Wikipedia.org.